Blessed Lord, in whose sight the death of thy saints is precious; we magnify the Name for that abundant grace bestowed on our late Martyred Sovereign; by which he was enabled so cheerfully to follow the steps of his blessed Master and Saviour, in a constant meek bearing of all barbarous indignities, and at last resisting unto blood; and even then, according to the same pattern, praying for his murderers. Let his memory, O Lord, be ever blessed among us, that we may follow the example of his patience, and charity; And grant, that this our Land may be freed from the vengence of his blood, and Thy mercy glorified in the forgiveness of our sings; and all for JESUS CHRIST His sake. Amen. This is the prayer for King Charles I in the Book of Common Prayer (until 1859) on the day of his execution, January 30. Today, January 20th marks the beginning of Charles’s trial for treason against the English Parliament in 1649. His subsequent execution was commemorated with the printing of Eikon Basilike, illustrated with the above engraving. 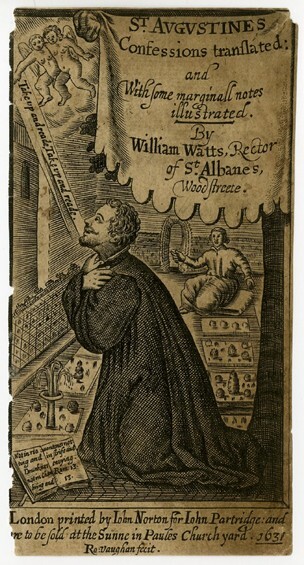 What perhaps often goes unnoticed is that the image is part of a larger genre of English printed images that depict holy figures kneeling in prayer. Richard Day’s collection of prayers Christian Prayers and Meditiations contained a woodcut of Queen Elizabeth kneeling in prayer. 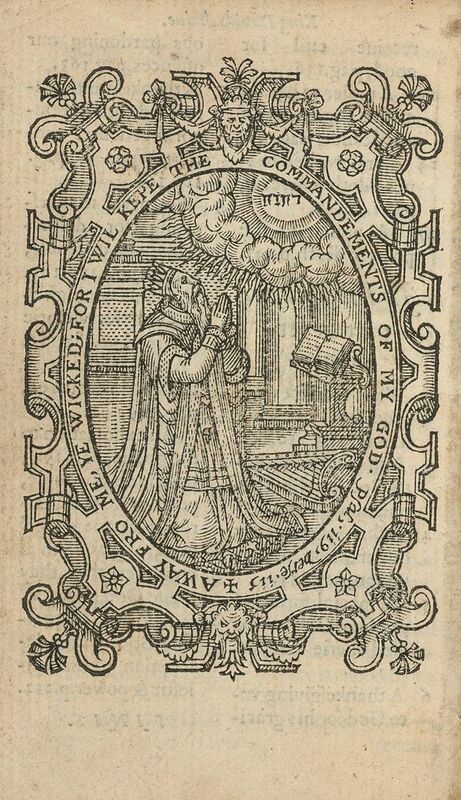 On every page of the Elizabethan prayerbook Certaine Select Prayers … Out of St. Augustine’s Meditations (1574) images of biblical figures were protrayed kneeling in prayer before the name of God. Similarly, in 1579, a popular image of King David first appeared in Thomas Rogers’ translation of the Psalms. 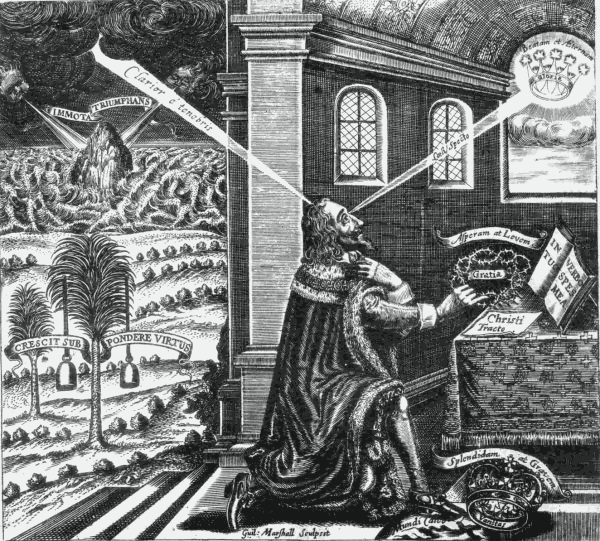 In the woodcut, the Old Testament monarch kneels praying before an open book, looking up at the holy name of God (the Tetragrammaton). Another example appeared in the first Protestant English translation of St. Augustine’s Confessions (1631). Here, Augustine, with a copy of scripture before him, looks up at two angels who are speaking the words “take up and read”. While John Milton’s Eikonoklastes (1649) served as a rebuttal to the Eikon‘s text, Milton failed to eliminate the powerful association that Charles’s image made with this earlier tradition. The Eikon had set up the king’s image among the great cloud of witnesses, among the saints and martyrs of church history, and despite Milton and other Puritans’ best efforts, it was an image that could not be erased.